I am a leading contemporary artist working in the South West of England and the South of France. I am in the process of periodically updating this new web site to provide an up-to- date resource to let you know about my art work. It may be worth a few visits to check on new updates. My work is hard to pigeon hole as I move easily from pure abstraction to seme representational pieces. 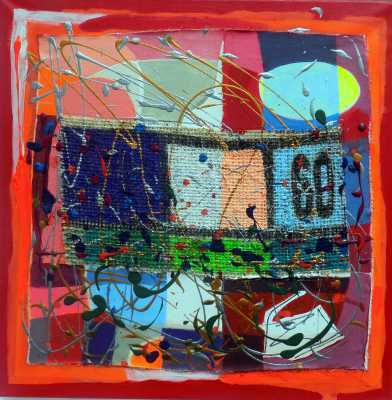 Colour and pattern fascinate me and I employ a wide range of mixed media, with collage , photomontage and assemblage. I was trained initially as a Graphic and Interior Designer and later in Fine Art I appreciate the contribution that design has made to the visual sensibilities which we share and love. My pieces are unique in that they acnowledge the heritage of design and yet fall firmly in the catagory of Fine Art. Teignmouth, Devon. 5th - 18th May 2018. The first showing of the whole series at this excellent local gallery. Image: Coffee Sack Series No. 5 . Norway Square, St Ives Cornwall. This piece is one of three paintings I have in the Christmas Open Exhibition. 24th Nov 18 to 3rd January 2019. An exhibition of four artists in the Artizan Gallery Stable. This piece was one of six I exhibited in the show. Shown in Australia. This piece is one of the five currently on display in this Bangalow Contemporary Art Gallery. From April 17. 80 x 80 x 3.5 cm. Mixed Media on Canvas 2017. St Ives Arts Club Exhibition. The St Ives Literacy Festival is a celebration of the arts, extending to music, performance, poetry, lectures and exhibitions of art throughout St Ives. This painting will be included in a mixed exhibition of Arts Club members from 9th to 16th May 2016. St Ives Society of Artists Exhibition. 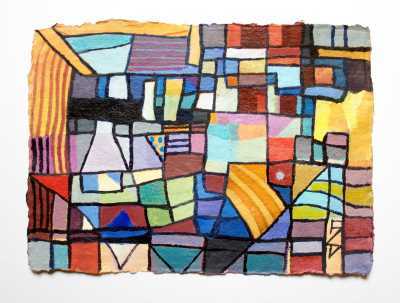 The St Ives Society of Artists Spring Open Show runs from 23rd April to 24th May 2016. This piece, one of two from my recent 'Coffee Sack Series, will be on show in this mixed exhibition. I was trained initially in Graphic Design, Interior, Environmental Design, and Exhibition Display, before going on to study Fine Art at The Harris College in Preston Lancs. and at Lancaster College of Art. I later trained as a teacher at Alnwick College Northumberland. 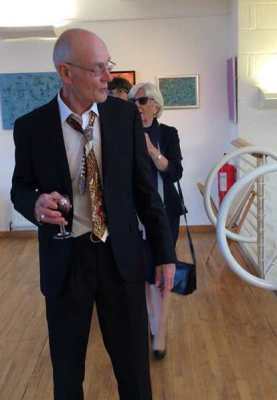 I taught as a Head of Art for many years gaining a Masters Degree in Art Education at Plymouth University. I have always worked as an artist and exhibiting extensively in the UK and abroad. See my CV on the 'About ' section for details of where I have exhibited. 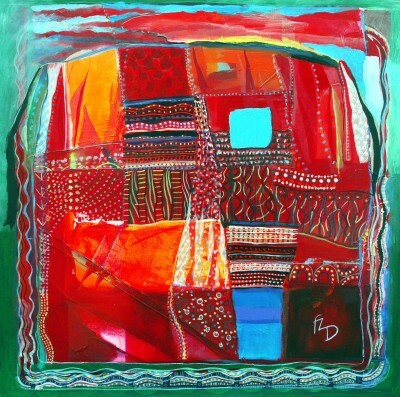 F G Davis is based in Devon and has been a practicing artist for over forty years. 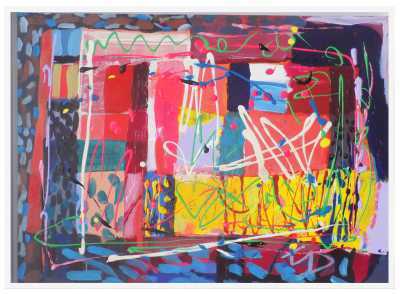 He works in a wide variety of media and is well known for his bold use of colour and contemporary abstracts. 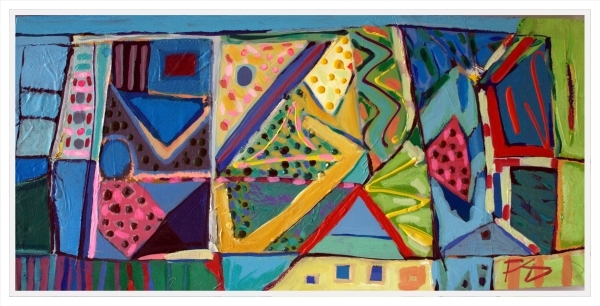 He has also had a successful career as a teacher of Art and holds a Masters Degree in Art Education.. 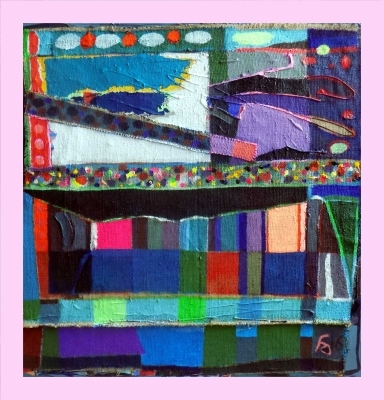 He works in mixed Media, Collage, Acrylic, Watercolour and Gouache. 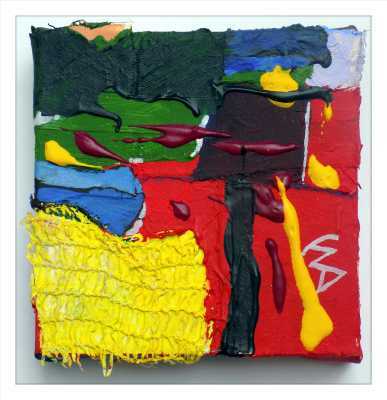 on paintings and assemblages. Available for commisions and bespoke pieces. Gives talks and demonstrations by appointment. A Full CV is to be found by clicking the 'about' section.